Cherine Anderson - In our modern day parade of glamour, glitz and unmerited superstardom, Cherine has taken today’s road less traveled; the path of paying dues, cultivating her abilities and developing her signature Dancehall Soul sound; a mixture of dancehall, reggae, soul and r&b. In only three short years, Cherine has become one of Jamaica’s leading young female singer/songwriters and performers. Her genre defying grooves coupled with her powerful voice and thought provoking lyrics have brought her in front of well over 1,000,000 live audience fans in the past 18 months. With a growing army of supporters, who she affectionately calls her “Dancehall-SOULdiers”, she has had the privilege of steadily touring in places such as Jamaica, Europe, Canada, Australia and the USA. The east Kingston bred native is a constant and consistent positive representative of Jamaica; from penning and directing chart topping videos for her inspirational songs such as “Kingston State of Mind” and “Shine On Jamaica”, to stand out performances at the Inaugural Green Ball and Peace Ball during Barack Obama’s Presidential Inauguration, as well as the World Games Special Olympics, to reaching the Billboard charts. Cherine has made numerous appearances on television programs in Jamaica, Australia and the United States including The Late Late Show with Craig Ferguson and The Ellen DeGeneres Show and twice appeared on the award winning local show Profile with Ian Boyne. 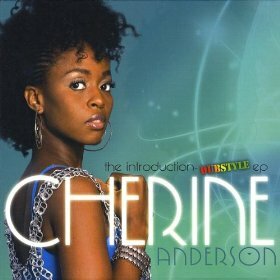 Cherine Anderson is the first Jamaican female artist to hit the Billboard Rock Charts as she was featured on the song “Say Hey, I Love You” with Michael Franti & Spearhead. After almost 52 weeks the song is still on the iTunes charts and has been placed on the soundtrack of numerous films and TV commercials including the EA 2010 FIFA World Cup South Africa Music Soundtrack. She dominated both local and international reggae charts with her smash hit single “Shine on Jamaica” from her critically acclaimed EP The Introduction-Dubstyle EP. “Shine On Jamaica” peaked at #1 for four weeks on both the NY Reggae Charts and South Florida reggae charts, and reached the top 10 charts in London. The EP also produced reggae hits such as “Talk If Yuh Talking” and “Kingston State of Mind”. As a result, in early 2010 she was honored with the award for Best Female Vocalist of the Year at the Jamaica Excellence In Music Awards.